Red dot sights are one of the best additions you can make to your 1911. However, no sight is complete without a good mount that adds to its accuracy-enhancing effects. There are all kinds of mounts on the market for you to choose from; how can you tell which is worth your time and money? Let us help with that. So, why go to the trouble of mounting a red dot sight on your 1911 anyway? There actually several great benefits that come with making this simple modification to your already-formidable weapon. Red dot sights allow you to solely focus on your target and engage much more quickly than with traditional sights, with which you have to keep the front portion of the sight aligned with the rear portion. With these, all you have to do is look at the dot. Taking on targets long-range is a lot easier with a red dot sight because you’ll be able to see where your round will hit much more clearly than with a traditional type. This can be particularly helpful with novice shooters still working on their accuracy techniques. Shooting in low light is also easier with a red dot sight because it's extremely easy to distinguish in dark settings. If your vision is starting to decline, this benefit is even more important. To acquire all of these benefits, you’ll need a great mount that can allow you to take advantage of a red dot sight without throwing off the balance of your 1911. Before we get into our favorite red dot mounts, let’s go over a few important factors to consider that will help us distinguish the best mounts from all the others. Consider where you’re going to mount your red dot sight before you start looking for a mount. There are several different types of mounts or positions where you can place a device, such as on the dovetail, on the slider, or on a separate mounting system altogether. Each has its benefits, and most people prefer one or the other based on experience. Some mounts allow you to adjust the position of your red dot sight after it has already been installed. If this functionality is important to you, you obviously need to find a mount the lets you fiddle with the exact positioning of the sight after installation. You also want to find a mount that’s durable enough to withstand wear and tear. A poorly made mount will eventually falter and your sight will go with it. Get something long-lasting, even if it costs a little bit more up front. Most mounts are made from some kind of polymer. This is okay, but mounts made from more durable materials are often a great choice because they last longer and can withstand more pressure. Steel or aluminum alloy mounts are great picks if you're looking at lifespan. However, these can be slightly more difficult to properly install. Now we can take a look at our favorite red dot mounts that are all perfect for combining with a great red dot sight. For a top-tier mount that won’t also break your bank, consider the Ade Advanced Optics Tactical Mini Red Dot Sight Mount. If it’s pretty standard Colt 1911 frame, which is extremely common among 1911 users. If you don’t have a perfect Colt frame, it’s still adaptable enough to work with a lot of other typical 1911 frames. This frame can easily replace a standard Picatinny Mount that will usually come with a red dot sight. It’s made with extremely high-quality material and, once attached, is extremely secure and firm so that you can be confident in its consistency no matter how many shots you fire. The mount is very stable, which will assist with the overall accuracy you receive. It’s adjustable too, although there isn’t a lock for the finger switch, so be careful not to accidentally unlatch the mount while you’re in the midst of a shooting situation. A warranty for your entire life is included with the purchase, and since the asking price is so agreeable, there’s a lot of value packed into the product. It’s stable, standard, and versatile. It’s the ideal mount for red dot sights for virtually every 1911 user. This adjustable mount is easy to install and is very secure once it's settled. 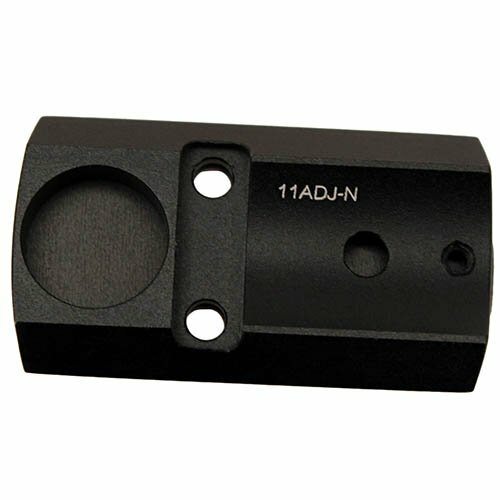 It's made from high-quality materials and is extremely affordable for virtually every 1911 shooter. The JP Enterprises Jpoint Mount Adapter mount is another solid pick, although it’s a little more expensive than our overall top pick. That being said, there’s a lot of value in the purchase that’s derived from the overall durability of this mount. In terms of total lifespan, this is one of the longest lasting mounts you’ll find. This Novak-fitting mount does need the rear sight to be cut from your 1911 before it can be installed. Since this requires a little more machining than other mount installations, there’s a slightly higher barrier to entry for using this mount. If you can manage the cut, however, you’ll find the mount is extremely steady and stable and is potentially even more secure than the one we picked as the best overall. The screws here are a little long, so be careful when installing and be aware that you may need to machine the screws down just a tad to make it fit your particular model of 1911. This is another high-quality red dot mount that can be easily installed, provided that your 1911 frame is the right size for screws. You will have to remove the rear sight, but if you can manage this you’ll be rewarded with a very durable, very stable mounting system. 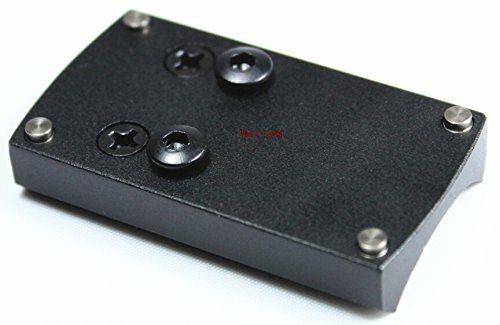 The Burris 410322 Mount is another Novak style mount. It’s adjustable, too, and is a little bit elevated compared to a lot of the flat models that you see on the market. This elevated style might be to your liking, although getting used to the new location of the red dot will definitely take some adjusting. The mount is extremely steady even if you are firing very quickly, speaking to its overall security once it's been properly installed. Mounting it, in general, is very quick and adjusting its position doesn't take too much effort. However, you will need to be careful they don’t accidentally adjust in the heat of the moment, although this is likely not a problem that many users will run into. This mount is a little pricey, but it’s a great pick if you’re after overall quality and aren’t too concerned with the asking price. It’s made by Burris, so you know that you’re getting exceptional quality and great bang for your buck. This can be paired with a Burris red dot sight for even more guaranteed quality. 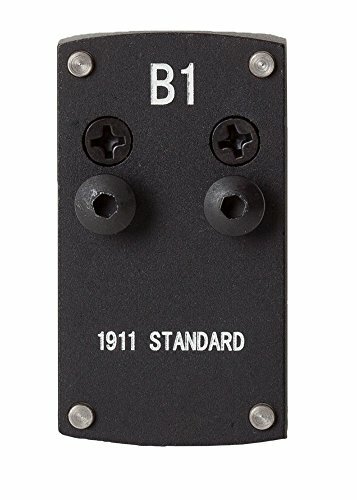 This is an adjustable sight that’s great for maintaining accuracy through long periods of sustained fire in which secures itself to your 1911 very firmly. Adjusting it is incredibly easy despite its security and it’s made of high-quality materials. Here, we have a more unique sight that’s made from aluminum alloy, which is both lighter and stronger than many of the standard materials red dot mounts are commonly made of. The Sightmark Mini Shot Pistol Mount is built to fit a standard Colt 1911 design and is shockproof and weatherproof. These are great qualities to have because it means that you can use the mount with your 1911 for years to come without having to worry about its durability and dependability. No matter the inclement weather, you can rest assured that your mount is not going to falter anytime soon and take your red dot sight with it. Even better, it’s shaped specifically to afford you with a wide field of view to assist with the accuracy benefits already implemented by your red dot sight. Put together, you’ll see great accuracy improvement right away. One minor flaw it does have is that the screws tend to be a bit long no matter what frame you use. This means you’ll likely have to trim down the screw length manually. However, if this isn’t a deal breaker, this is one of the best sights you can get, especially since it’s so affordable. This sight is a lightweight model made from aluminum alloy that is still tough enough to be both weatherproof and shockproof. 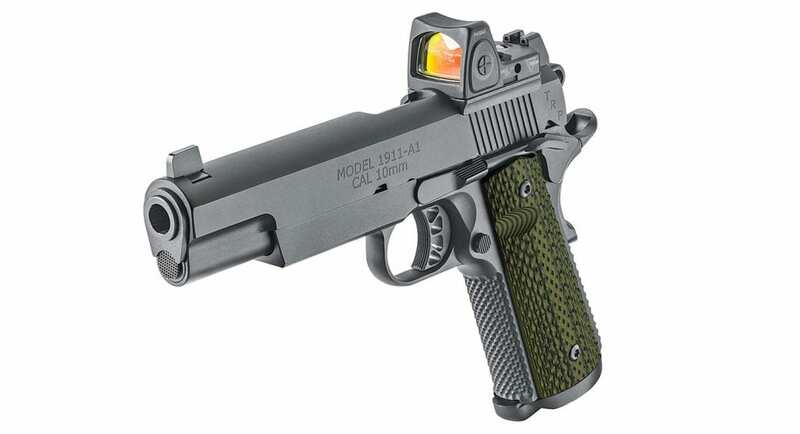 It’s built for standard Colt designs and offers an extremely wide field of view. Finally, let’s take a look at the Vector Optics Tactical Mini Red Dot Sight Pistol Mount. This, too, was made with an aluminum alloy, which imbues the mount with extra strength and durability yet is lighter weight than most typical mounting materials. 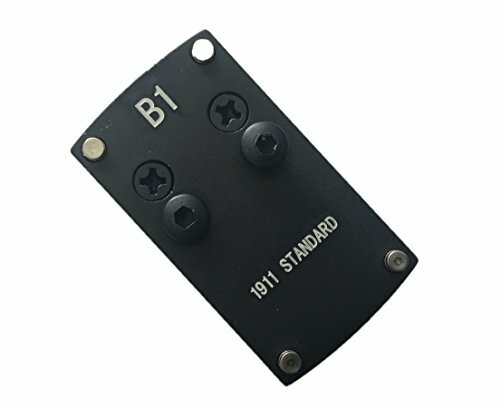 This can assist with overall balance and accuracy when using your 1911, especially if you’re used to a particular weight or feel for the firearm. It was designed specifically for use with mini red dot sights, although you can use larger versions as well, provided that they are not so large as to overwhelm the mount. Since most mounts aren’t made for smaller sights, this can be particularly helpful if you have a small sight you already want to use. The mount is extremely durable and built to last through thousands of shots. Even with all of these excellent qualities, it looks amazing. It has a great black matte finish that can easily fit with the military aesthetic that a lot of people like to emulate with their personal 1911s. The only real issue is that it can only be used fully with the G.I. style rear sight. This, along with the fact that it sized for miniature red dot sights, drastically limits the number of people who can make use of its great functionality. With all of this information, you should be all set to mount your red dot sight and take it to the shooting range. With the increased accuracy available to you thanks to the sight, you should have no trouble breaking your previous marksmanship records. Have fun out there!